Saving money is important – we all know that. But sometimes everyone needs some help in coming up with ways to save money. I’m going to break down the exact strategies that I use to save more money each month. If you know me, you know I’m pretty lazy when it comes to this stuff. But these tricks and hacks are simple, and they save a lot of money. Going back to my frugality equation, all time spent on these saving tricks earns me tons of savings. We all know the basics – spend less than you earn. But how do you really spend less? You first have to have the right mindset to save, and then you have to take advantage of every trick possible to boost that savings. This already assumes you’re tracking your money each month. If you’re not, take a look at Personal Capital and get started for free. After that, it’s mindset. And your mindset need to be this: Each month start with a spending budget at $0. It’s easier to just buy nothing than to buy something, and stop budgeting. Every purchase needs to be thought of very intensely. Only spend when you have to. Finally, it’s about leveraging tricks to help you. Here are our top 15 tricks to save money. 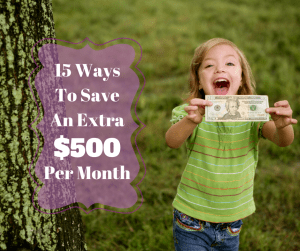 This list will save you over $590 each month if you follow it diligently and use all of these strategies. That means you could save over $7,000 per year! The first trick, and one of the most important ones, is to use a cash back rewards credit card for all spending that you do. I’m talking everything. The best rewards credit cards pay 2% cash back as a baseline. Some cards offer up to 5% on special categories of spending as well. You can find the best top cash back rewards cards here. By putting everything on a rewards credit card, you’re saving at least 2% on everything you spend each month. If your average spending is $1,000 per month, this tactic can save you $20 per month. The problem is, people don’t spend everything on the same card. Even I mess up sometimes. For example, I recently discovered that my car insurance could have been paid for on a credit card. I’ve been having it directly debited from my checking and earning no rewards. Considering the my bill is about $100 per month, I could have been saving $2 per month for literally doing nothing. I switched it over, and now I’m saving money! As you can see, for 6 months, this strategy has saved me $424.81. That breaks down to $70.80 per month in savings. There are spending tricks that you can use to boost your savings when making a purchase. I’m not an expert in this area, but there are a lot of blogs that are. The problem with many of these tricks is that it can take a lot of time and effort to find the best ways to take advantage of credit card deals. And like I said earlier, I hate spending time and effort if I can’t get the reward easily. However, there are simple tricks that you can do right now to boost your savings. The easiest way to do this is to simply take advantage of credit cards that pay more for certain categories of spending. For example, American Express is offering a Blue CashBack Everyday Credit Card, which pays 3% cash back at supermarkets. The great thing about grocery stores is that most of them sell gift cards to other retailers and shops. Another reward perk that I take advantage of is on groceries and gas. I normally spend about $500 per month on groceries, so getting 3% cash back equates to $15 per month. Now, I also spend about $400 per month in gas. If I buy a gas gift card at my grocery store, I’m actually spending another $400 at the grocery story – getting that same 3% cash back. That’s another savings of $12 per month. Do you search the Internet for stuff? I’m talking random searches, like “What Time Does The Stock Market Open“? If you do, you could be earning extra money just for your normal online habits. For example, Melanie highlights how she made $5 in two weeks using Swagbucks for her normal searches. I signed up for both Swagbucks and InboxDollars and earned $5 instantly just for signing up. If you signup for each, you’d get $10 the first month. Ongoing, this is a way to save $10 per month by just doing your normal activity. My next secret to saving money is to use Ebates or TopCashBack for all your online shopping. The great thing is that you can combo this with credit card cash back rewards and hacking to save even more money. 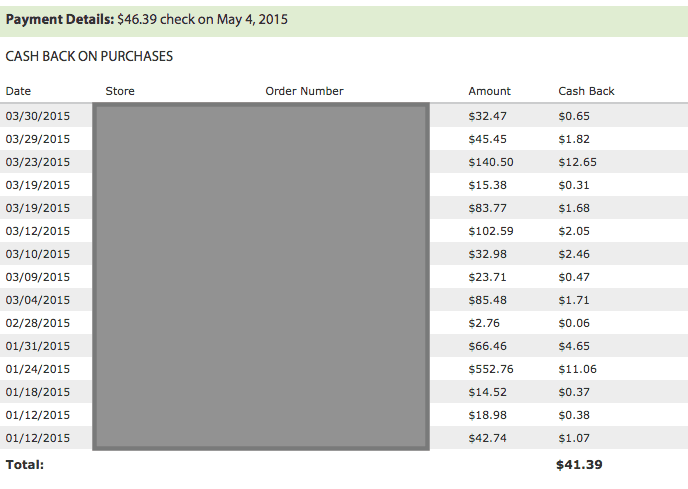 As you can see, I spent a total of $1,260.55 online over the first three months of the year. That earned me a check of $46.39 – the $41.39 you see in the screenshot, plus a $5 bonus for spending at a certain store that month. That equates to a 3.7% rebate on all online shopping I did for the quarter. Remember, when it came time to pay, I also used a rewards credit card that earned me 2% cash back – effectively saving me 5.7% on all my online shopping. The best trick for using Ebates and TopCashBack is to wait for a sale on the site – sometimes they offer 10% or more cash back for your regular shopping. This is when it can be very worthwhile to use their service. The average gym membership costs around $50 per month. Even if you go with a “cheap” gym, you’re still looking at paying around $20 per month. Plus, many gyms have activation fees or signup fees that can boost the annual cost big time. Here’s the worst part – according to Stephen Dubner and Steven Levitt, the authors of Freakonomics, the average person overestimates how much they’ll use the gym by upwards of 70%. Essentially they are only getting 30% of their money’s worth. So what’s a person to do? Look for ways to work out without having to go to the gym. MoneyCrashers has a great list of 13 Ways To Exercise Without Going to The Gym, including running, biking, playing an outdoor sport, and more. Many people, including myself, forget about the value of organization and how it can really translate into monthly money savings. I’ve written before about the power of getting organized, but it never ceases to amaze me how much I could potentially spend when I’m disorganized. To get organized, take a few tips from our family. First, we keep all of our toiletries in one spot in the hall closet so that we know if we’re out of something. Second, we keep the pantry organized by type of food as well, so that we don’t skip over something. Finally, we keep a list of everything we need to get at the store each week. This may seem simple, but it prevents doubling up on buying things that we don’t need. For example, the other day I thought we were out of soap – I’ll admit I was lazy and didn’t look in the closet. I added it to the shopping list, but my wife quickly discovered that it was in the hall closet. Given that soap costs about $5, that’s a savings right there. Now, it’s not a lot, but it can add up if you’re not organized. The next strategy I use a lot is to buy used, and also sell used. What do I mean by this? Whenever I’m looking at purchasing something – like a household good, electronics, or even a car – I look a buying it used or refurbished. There’s a ton of savings to be had if you buy things refurbished. Inside the Apple Refurbished and Clearance store, you can find savings of 15% or more on almost every product that Apple carries. Plus, all of these items have the same warranty as any other new product purchased from Apple. Part 2 of the equation is to sell used. Whenever we upgrade to something new, we don’t just let the old stuff sit around – we sell it. For example, I was replacing an old iMac. It wasn’t worth much, but I was able to sell my old iMac for $450. 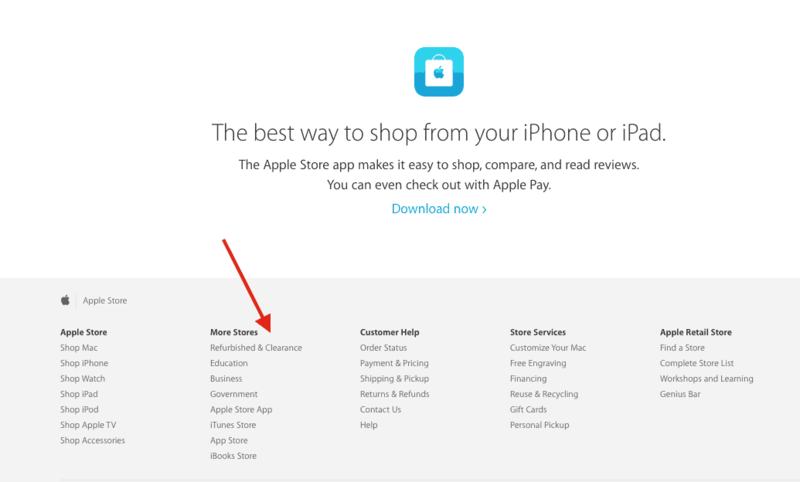 Apple has a great program where you can sell your item back to them for an Apple Gift card, which you can use for anything from Apple. You can learn more at the Apple Recycling Program. However, if I didn’t have an Apple product, I would look on selling my item on Amazon.com or eBay. So, not only am I getting a savings on the new computer, but I’m selling the old computer to offset the price. There’s big savings to be had here. 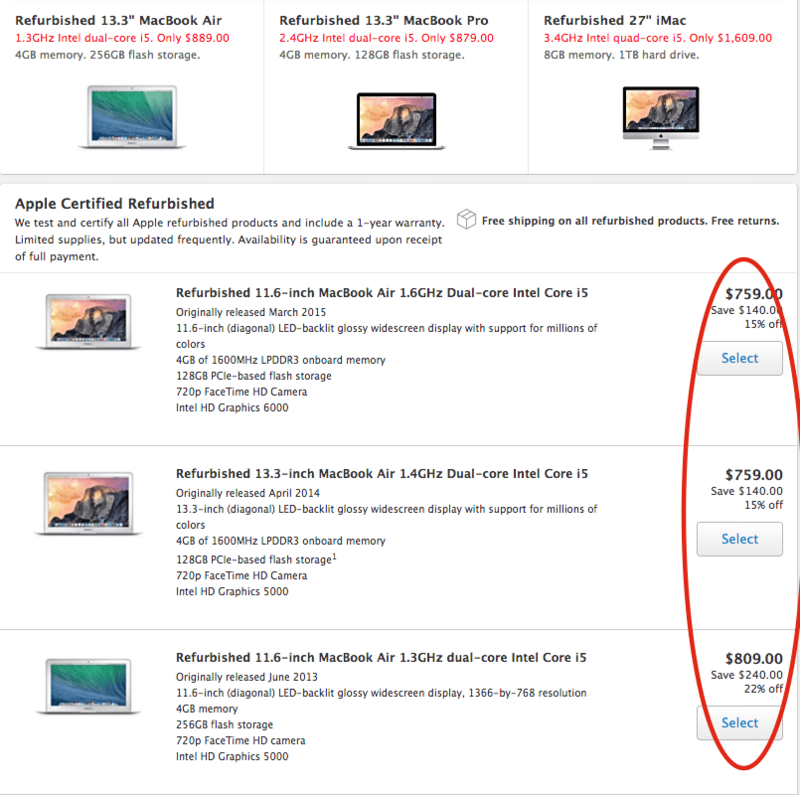 In my example, I saved $240 on my new MacBook, and sold my old iMac for $450 – a total savings of $690. While that’s not something that happens monthly, I would say that I get this type of savings yearly. So, we can divide this savings out per month. Even if you don’t want to buy things used, you should still check and compare prices. I do this all the time – especially when just buying the regular stuff I need to purchase each month. 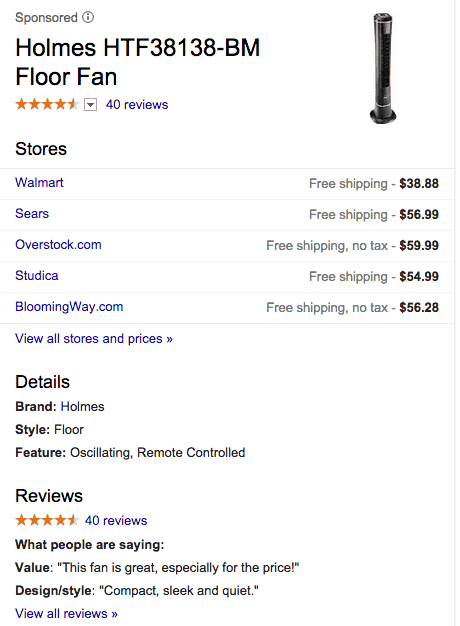 If I’m in a store, I always pull out my smartphone and use my Amazon app to compare prices on everything. I don’t necessarily buy it on Amazon, but it gives me a good sense of the best price. If I do end up buying the item online versus in-store, I always take advantage of Ebates to combo the savings. So, not only am I getting the best price, I’m getting rebates and credit card rewards. I do this on almost every purchase now and find savings almost every time. For just comparing prices, we can see the savings of $21.11. When you purchase something, you need to hold on to all of your receipts. I suggest having a file where you store all of your receipts for at least a year – longer for big purchases like appliances. You would be surprised by the savings you can find each month by getting adjustments on your past purchases. Almost every retail store has a price adjustment policy, but I would venture that 98% of consumers never take advantage of them. Macy’s: Offers a price adjustment within 14 days of purchase. However, some companies will do adjustments as long as they carry the item at full price. 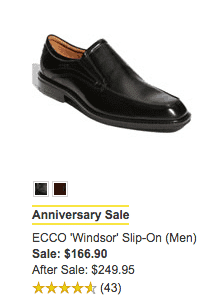 I purchased a pair of shoes at Nordstrom earlier in the year, and it recently went on sale during their Anniversary Sale. Even though it has been about 6 months since I purchased the shoes, Nordstrom honored the price adjustment. And as you can see, it was a hefty amount – $83.05. If you can get that savings twice a year, it’s worthwhile. The next big cost cutting expense is to simple cut your cable. With all of the shows you can watch for free online, there is no reason to pay for cable anymore. 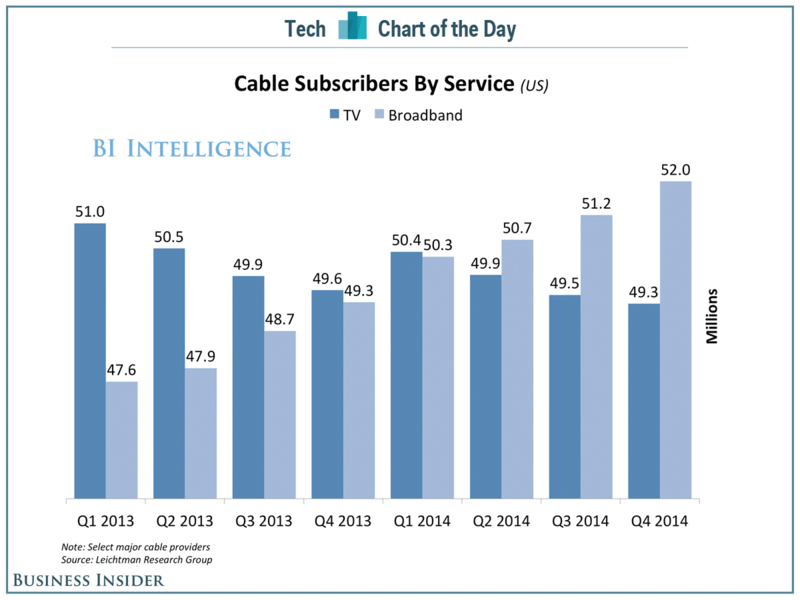 Cable TV is expensive, and while Internet is still pricy each month, the savings by not having cable is huge. We recently cut our cable, and it has saved us $100 per month. Even on the lowest cable plan offered by our cable company, it would have been an extra $100 per month to have basic cable channels and the box to get it. Instead of cable, we opted to buy Apple TV along with Netflix. The Apple TV costs nothing each month, and Netflix runs us an additional $7.99. We also purchased a digital antenna to get the local channels, which actually works surprisingly well and we can watch the news and several sports programs. We’re torn between looking at HBO NOW or not, but it’s always an option. If we ever want to rent a new release or buy a show, we can do that through the Apple TV. It’s funny because prior to cutting cable, we could have never fathomed not having it. Now, without it, life is just simpler and cheaper. One of the biggest expenses that most families have each month are utilities. These are the essentials – power and water – that everyone typically pays for. These “mandatory” expenses can add up if you’re not careful. But there are several ways that you can save on utilities each month. First, for power, switch every lightbulb in your house to LED Lightbulbs. This can provide substantial savings in your house – they use 90%+ less energy than standard lightbulbs. For comparison, in July 2014 we used 676 kW of power, and in July 2015 we used 288 kW. That translated into a $100 per month savings! However, LED lightbulbs are expensive. They cost about $7 or more per bulb, if you find them on sale. However, most of the power companies across the United States are currently offering rebates on bulbs. You can go to the Energy Star Rebate Finder and select “Light Bulbs” and see if you can get a rebate on your bulbs. Many companies are offering rebates of around $4 per bulb. That lowers the price substantially and makes it even more worthwhile. Another way to save on power is to use a free tool like OhmConnect that allows you to get rebates for cutting back your power during certain times. It’s not a ton of money, but it gives you a little extra in your pocket each month. Next up is water. Water is a tough one, because it’s hard to find ways to save. In California, though, it’s even more important to save water because of the drought – and water companies are raising rates and adding penalties as a result. However, just like power companies are offering rebates to conserve, water utilities are also offering rebates to conserve. In California, the water companies are offering rebates on buying high efficiency clothes washers, high efficiency toilets, weather-based sprinkler controllers, high efficiency sprinklers, and more. I recently was able to purchase a new sprinkler controller and all new sprinklers for FREE after the rebate, and it decreased our water usage by about 10% – or a $20 savings. Automating your savings is one of the best ways to boost your overall savings. If you work and are offered a 401k or 402b, one of the best ways to save more money each month is to simply boost your 401k contribution. These contributions are pre-tax, so if you boost it by just 1%, you’ll barely even notice a change in your take-home pay. It’s as close to a painless way to save as possible. Take the example of making $35,000 per year. If you boost your 401k contribution by just 1%, it will contribute an extra $29.17 per paycheck (if you’re paid bi-weekly). That increases your annual savings by $758.42, which is huge! Want to do more than just 1%. Check out this great calculator and see all types of different scenarios. Insurance is one of those areas that’s typically set and forget for most families. You sign up for insurance when you have to (when you buy a car, or when you move), but otherwise you likely never look at it. Instead, you should be checking your insurance policies at least annually. You’d be surprised how much you can save by checking simple changes – like the mileage you drive or the value of your property. For example, I recently checked the mileage that was on my car insurance policy. When I signed up, I selected 15,000 miles annually on average. However, based on my last year of service records, I’d only driven 10,000 miles. By going online to USAA and changing this one fact, it lowered my bill by $5 per month. Check out my tool for finding the best car insurance rates. This one is a tough one because investment expenses are typically “ghosts” – meaning you don’t really know they are there, but they’re taking money away from you each month. Investment expenses are commissions and annual fees that you pay to invest. 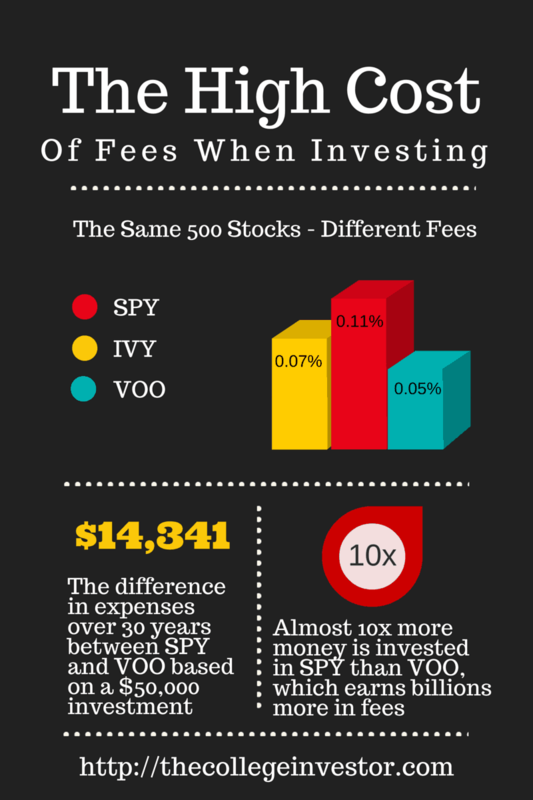 Investing in the same exact stocks can cost you $14,341 over 30 years. That breaks down into a monthly expense of $39.84. Why are you giving up $39.84 to invest in an more expensive ETF that invests in the same 500 stocks? The trouble is that these fees are hidden. You don’t know they’re there. While the government has tried to make fees more transparent, they are still lost on most individual investors. Luckily, there are two tools that can help. The first is Personal Capital. I recommend Personal Capital as a free tool to simply organize your financial accounts (which you should be doing already). What you probably didn’t know is that they also have a Retirement Fee Analyzer that will tell you how much you’re spending in fees annually. By finding these two funds, and switching them out for lower cost funds, I was able to save roughly $800 per year – or $66.67 per month. You can see, it estimates that I’ll save approximately $400 per month as well, and even highlights a potential ETF that I could buy that matches my investment objectives. Both tools offer great interfaces. Personal Capital is a great long term solution because it helps you manage all of your accounts. But if you’re worried specifically about investment fees, check out FeeX. Finally, do you have truly free checking? I’m talking $0 fees. Even “good” banks and credit unions, like Navy Federal Savings Bank, have started charging customers random fees – like account minimum fees and inactivity fees. If you don’t maintain enough in your accounts, you can quickly see your balance eroded by fees. That recently happened to me – I maintained a small account at Navy Federal and suddenly saw a $3 fee for inactivity. Sorry, but I don’t use my savings account – that’s why it’s a savings account. Either way, I moved away from there and setup at USAA. USAA offers truly free checking, with no minimums or fees, and even ATM reimbursement – so you don’t have to pay that nasty $4.35 per transaction. If you’re not enjoying truly free checking, you’re not saving enough when it comes to banking. It’s always important to remember the time it takes to save money – that’s a big part of the frugality equation. You don’t want to save $1 if it takes you 5 hours of work. That just doesn’t make sense. 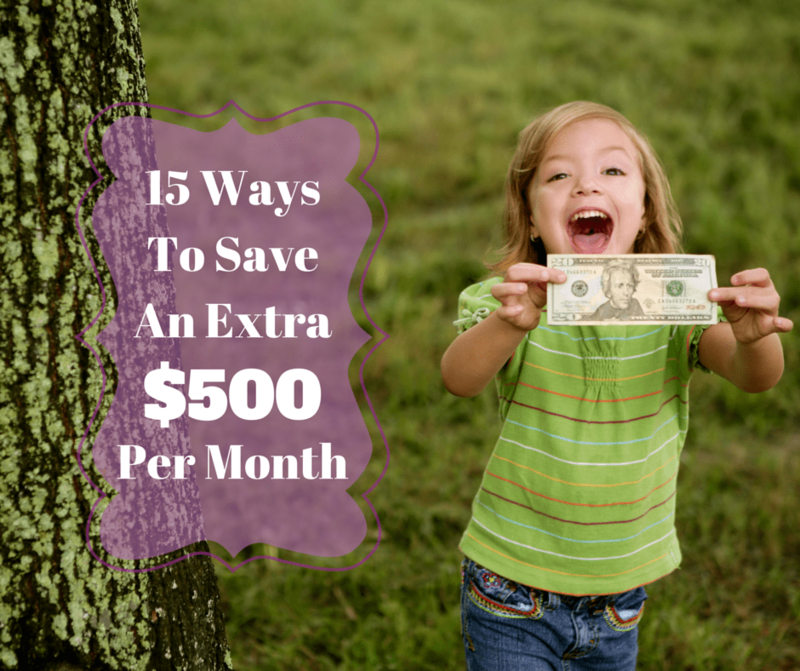 If you add up all of the savings from these tasks, you’ll save $591.07 per month. That adds up to over $7,000 in savings per year. So, as you can see, this entire list of extras maybe adds up to an extra 2 hours and 20 minutes over the course of an entire month. To save $590, that works out to roughly $246 per hour of work in savings! Remember, saving money is only half the equation. You should also focus on earning more money as well! That’s the real secret to building wealth. Check out our resources on 50+ ways to earn extra money in college, and ways to setup a passive income stream. Capital One 360 checking is also totally free, and there is no minimum balance to earn interest – not a huge rate but every little bit helps. Take FULL advantage of 401K contributions. It will change your net pay by a few dollars, but its worth it. Sharebuilder – now Capital One investing apparently – is a cheap way to buy stock. We buy stock in companies we buy products from or those that we have used for a long period of time. This is a long term strategy but if you have non invested funds, that money can earn interest as a mutual fund account. Not huge earnings there, but higher that the run of the mill checking/savings these days. One thing the article left out – LEARN TO COOK. Eating out is unhealthy and expensive. Tip: Shop from the grocery ad’s front page for the best deals. This is a great article Robert! Nice work with all the legitimate ways to save money. These actually do work. Thanks for the nice and practical tips! You can improve yourself with DIY stuffs, like cooking, gardening or some mechanic skills. They can help you save some unnecessary repairing fees. And like Melissa said, cooking > eating out.